If there was ever a serious consideration of reintroducing wolves into Britain, it is worth reflecting on the lessons of wolf migration in Europe. 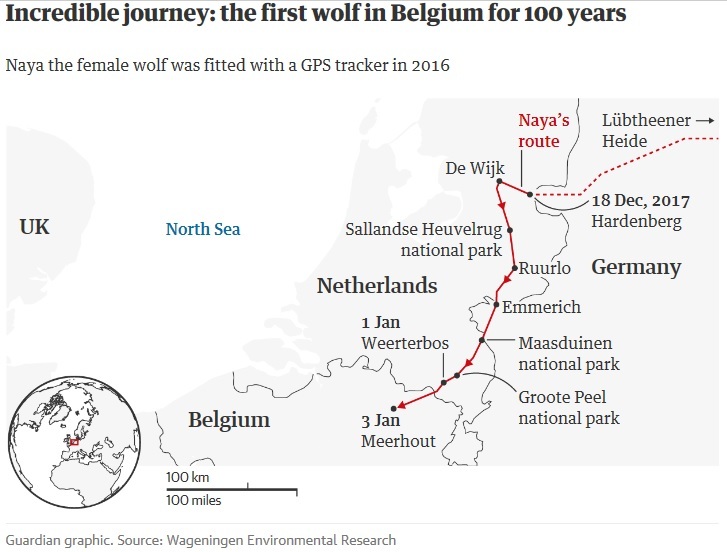 News has come in this New Year that farmers in Belgium have been alerted to evidence that a female wolf originally from eastern Germany that has been making a pioneering trek through the Netherlands and into the northern Flanders region. This confirms a return of the predator to every mainland country in Europe, turning back decades of persecution. Wolves have recently migrated into Luxembourg, the Netherlands and Denmark – the latter after a 200 year absence. even in Denmark, where there is a rather pragmatic acceptance of wolves, the wolf debate is value driven rather than about concrete problems based in reality. Their populations have abundant roe deer available as prey and few issues arise. However our response need be not one of horror, shock or fear. The success and impact of wolf populations will be a measure of how we, as humans, react (or overreact) to the presence of these animals. In the UK relative hysteria arises when the singularly smaller and more wary lynx escapes a zoo and spends a few days in the local countryside. As ever conservation is first and foremost about cultural norms and political preference. A country’s viewpoint may be as much at odds with another for the most intangible reasons. Attitudes in the UK towards predation by pet cats versus attitudes towards the same pet cats in Australia or the United States, for example. This entry was posted in Conservation, Cultural Impact on January 23, 2018 by Simon Black.